Concluding that Nickerson Field was not suitable even for temporary use, Matthews again approached Harvard, but the school refused again. He then hashed out a deal to move to Foxborough, but ultimately decided against being a tenant of an NFL team. After floating offers to move to Seattle, Honolulu and Portland, Matthews ultimately decided to move to New Orleans. 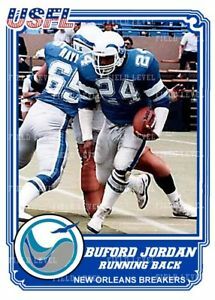 He sold a 31 percent interest to real estate developer Joe Canizaro, and the move to New Orleans was approved by the USFL on October 18, 1983. Matthews later sold his remaining stake to Canizaro, but Vataha remained as team president. The New Orleans Breakers were an American football team that played in the original United States Football League (USFL) in the mid-1980s. Breakers – The Breakers nickname is a carry over name that originated in Boston and then traveled to New Orleans which means a heavy sea wave that breaks into white foam on the shore. Breakers could not hope to compete with the Saints, and opted to move before the 1985 season rather than play a lame duck season in New Orleans. Who is the greatest New Orleans Breakers?